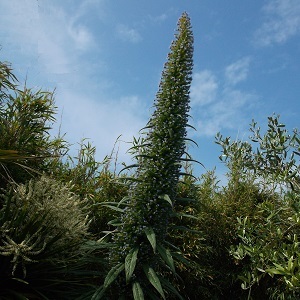 This is the original blue form of the highly unusual Tree Echium. A hardy biennial that grows a large rosette of silver-grey leaves in the first year, and a very tall flower spike of blue flowers up to 4.m high in the second or third year. Plants generally flower from June to September. Each spike is made up of masses of tiny blue flowers that attract lots of pollinators. These are very striking and impressive plants, but tend to be on the tender side, so they need a nice warm, sheltered, open and sunny position for flowering, and the rosette may need protection in a greenhouse in the first winter. They grow and self-seed outside in the warmer parts of the UK, such as here in Cornwall, in sheltered coastal sites. Pack of 20 seeds. Sow in spring/summer for flowering the next year. Sowing instructions and a colour photo are printed on the packet. Some parts of the plant are considered toxic. Sow seeds in spring/summer in moist compost at a depth of about 6mm. Keep at 13-18°C and germination takes 1-2 weeks. Pot on seedlings into pots when they are big enough to handle. Seeds can be direct sown in warmer gardens in late spring/summer. Protect plants over the winter from severe frost in a greenhouse or cold frame before planting out in the spring. In warmer gardens, plants can be left out over winter, protected with horticultural fleece. Protect young plants from slugs. Grow Plants grow a rosette of leaves in the first year and flower in the second or third year. They are evergreen. Plants die after flowering. They self seed in the right conditions and grow into impressive clusters of plants that re-new themselves year after year. If kept under glass, protect plants against spider mites.